Fast casual's two hottest stars have both been beaten down lately. Here's the one with more potential to bounce back. Arguably, no two companies better represent the fast casual space Chipotle Mexican Grill, (NYSE:CMG) and Shake Shack Inc (NYSE:SHAK). Chipotle, the veteran of the group, opened its first store in 1993 and went public in 2006. Its success has spawned a rush of restaurant IPOs, though none have matched the success of the upstart burrito roller, which now has nearly 2,000 stores under its umbrella. Shake Shack, meanwhile, was the brainchild of award-winning restaurateur Danny Meyer, and it began as a simple hot dog cart in New York's Madison Square Park in 2004, which evolved into a kiosk that drew a cult following. Shake Shack has slowly expanded in recent years and is now accelerating store openings following its IPO this January. For the investor looking to grab a piece of the hot fast-casual industry, Chipotle and Shake Shack present two of the more appealing opportunities. Let's dig a little deeper to see which of these two presents the better investment today. Chipotle stock is up more than 1,000% since its 2006 IPO, and its unit economics continue to be strong. The burrito roller posted a net income margin of 11% last year, and its restaurant-level operating margin of around 28% is the best of any major fast-food chain. 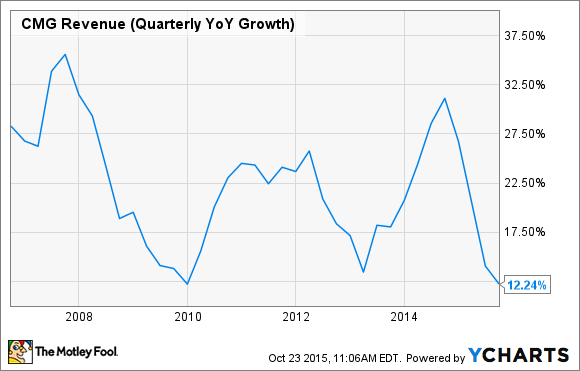 However, revenue growth has slowed dramatically this year as the company laps a particularly strong 2014. In its most recent quarter, sales grew just 12.2% with a 2.6% bump in comparable sales. The chart below shows the slowing growth. Only two other times in Chipotle's public history has revenue growth been this slow, and both times, it bounced back quickly. However, with management only forecasting low-single-digit comparable sales next year, the growth rate is likely to remain muted. Demand is not the problem. Chipotle restaurants regularly have long lines, and almost all locations operate at capacity during peak hours. Management's obsession with throughput -- how fast restaurants can serve customers -- shows that the growth constraints are on the supply side. The company is increasingly looking at strategies such as mobile ordering, a second make station, and better utensils to speed up service, which could unlock faster growth. The store base continues to expand by more than 10% a year, but management's ability to drive efficiency will be the greatest determinant to the company's future success. Shake Shack the company bears much in common with Chipotle. Chipotle co-CEO Monty Moran has even cheered on its fast-casual rival, saying, "When you come up with something like Shake Shack, or any better burger concept, or anyone doing a decent job making food that's respectable and decent to eat, such competition, I think, is good for us." Both companies are elevating consumers' expectations of fast food by using high-quality ingredients, modern decor, and traditional cooking methods. I own both Chipotle and Shake Shack, and I think both will outperform the market over the long term, but at this point, I have to say Shake Shack has the greater potential for blockbuster returns. Shake Shack, on the other hand, has crushed estimates in its first two reports as a public company, and I'm expecting another strong beat when it reports earnings on November 5. I think analysts are underestimating the power of its brand, which is not only fueling huge comparable growth at home, but has also driven monster sales at its international licensed stores. Though its P/E is in the triple digits now, it has the growth to justify it as earnings per share could hit $1 in just a few years. With a market cap of just $1.5 billion, it has room to grow into a valuation several times that.